If the Mutewatch digital watch strikes you at first as nothing more than a colorful and stylish wristband, inventor Mai-Li Hammargren has already won half the battle. The $259 Mutewatch has an all-touch interface and a silent vibrating alarm, a feature which Hammargren said was the idea she started with in 2007: She wanted to design an alarm that would wake her up without waking up her boyfriend. 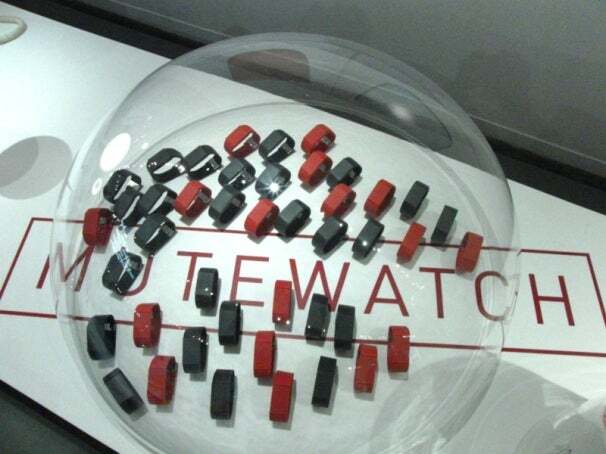 A few years and a handful of lawyers, engineers, friends, and other collaborators later, the Mutewatch was born and has now arrived in the U.S. At an October 27 launch event at high-end retailer Moss in New York, the Mutewatch seemed to hold its own next to $8,000 table clocks, a $130,000 Philippe Starck floor lamp with a scrolling digital display, and $40,000 chandeliers. The 1.4-ounce Mutewatch has a capacitive touch screen with large, simple characters and a light sensor. 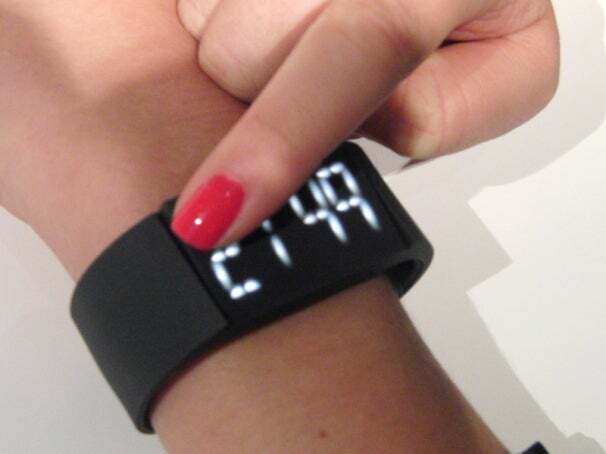 A small, flat, fold-away USB plug for charging and for software upgrades is integrated into the wristband. A two-hour charge lasts for about a week, according to the company. The touch screen stays off until activated by tapping the screen or by twisting your wrist to one side or the other. You set the time by tapping the top or bottom of each digit or by swiping up or down on each digit. To silence an alarm, you tap the three symbols that appear on the screen one at a time. The vibration alarm is strong enough to be noticed but, of course, is otherwise silent. The Mutewatch has a wry “Hand Wash Only” warning on the bottom to remind you that while it’s fairly resistant to water and humidity, it’s not meant to be immersed. The Mutewatch comes in Poppy Red and Charcoal Gray and will be available from the Mutewatch website and from a handful of high-end retailers, including Moss, Maxfield in Los Angeles, Cara & Co. in Sydney, and Lane Crawford in Hong Kong. A limited-edition white version is already sold out.